This week we're having loads of fun celebrating Valentine's Day, but with a new twist. We're celebrating it in Paris! Our continent of the month is Europe, so it's working out quite nicely. I had so much fun planning our activities this week. My husband helped out a great deal too. Oh, how I miss Europe! Just a reminder, Every Star Is Different is now on facebook. Check out our page, like it, and come back often! The kiddos will be introduced to some French vocabulary. They will match up English words to French words. We will also practice pronouncing each French word together. If you notice any corrections that need to be made to these cards, please don't hesitate to let me know. It's been a long time since I spoke French. It's amazing the things we forget sometimes. Source: I created the printable for this activity. It is included in my Valentine's Day in Paris Language Printable Pack. For your free copy, click on the link at the end of this post. The kiddos will practice their spelling words by covering them with chocolates. I learned as we practiced spelling words with sugar cubes, that it was very difficult for the kiddos to form their letters correctly without a template. Hence why word templates are provided. Dinomite and Princess will use M&Ms to create their words. Bulldozer will use Hershey's Dark Chocolate Chips, as he can not have M&Ms (allergies). The kiddos will practice subtraction, solving the problem on each card. They will use the pink hearts as counters and the red glass beads to mark their answer on each card. Source: I created the printable for this activity. It is included in my Valentine's Day in Paris Math Printable Pack. For your free copy, click on the link at the end of this post. This month we're working on our graphing skills as well. The kiddos will create a bar graph using the die and crayon provided. I've provided cards with the name of each place visited for reference. Creating this activity made my mouth water. Oh how I miss Paris! The kiddos will practice purchasing yummy French treats with American money. I thought this would be a great way to introduce them to foods they may not otherwise have interest in. We're introducing multiplication this month. How crazy is that? Wow! How time flies. The kiddos will solve the multiplication problem on each card using red hearts as counters and clear glass beads as markers for their answers. What's not to love about all of the places there are to visit in Paris? What a perfect Valentine's Day getaway. (I wish!) The kiddos will match the three part cards, learning the names of some of the most famous places in Paris. Source: I created the printable for this activity. It is included in my Valentine's Day in Paris Culture Printable Pack. For your free copy, click on the link at the end of this post. Paris is known for their art. Their museums are amazing. In this activity the kiddos will be introduced to art in two of the most famous museums in Paris. Again, what a perfect thing to do on Valentine's Day! The kiddos will separate the paintings by museum. They will be introduced to Impressionism. How I miss Paris. Source: I created the printable for this activity. It is included in my Valentine's Day in Culture Printable Pack. For your free copy, click on the link at the end of this post. The kiddos will be introduced to two French Opera Composers and two of their most famous operas. They will learn the composer's names and identify their pictures with the cards provided. Then they will get a chance to watch one short scene from each opera using the iPad. Source: I created the printable for this activity. It is included in my Valentine's Day in Paris Cultural Printable Pack. For your free copy, click on the link at the end of this post. This week we'll be experimenting with four French recipes. The kiddos will make croissants, crepes, French Bread, & chocolate mousse. Making the yummy French dishes will be exciting. Tasting will be another experience all together. I'm super excited about this! Hopefully the kiddos will be willing to try these new treats and perhaps even enjoy them. This week is full of visual arts as we learn about opera, art from different museums etc. We'll also continue to draw in our journals every day. The kiddos are being introduced to opera this week, which is super exciting for me. We'll continue to sing songs each day during learning time and practice the piano. We will continue exercising as a family. The kiddos will practice arranging the roses in a vase. The kiddos will practice pouring water back and forth without spilling. The kiddos will transfer chocolate from one dish to the other using spoon provided. The kiddos will trace a heart using the heart provided. Then they will cut it out. The kiddos will tweeze fabric rose petals from one dish to the other. The kiddos will shake hearts filled with different contents to find matches. There are six sets of two matching hearts. Our week includes lots of fun books, movies etc., as well. Feel free to check them out! Thank you for stopping by. Cassie is so amazing! Thank you for joining facebook! Great collection of activities, and your printables are great - cute but still "cool" enough to make my 6 year old son happy. Thanks for sharing! Thank you Erin. I completely understand the cute but still "cool" enough factor. My oldest son is 7. Hope to see you again soon! 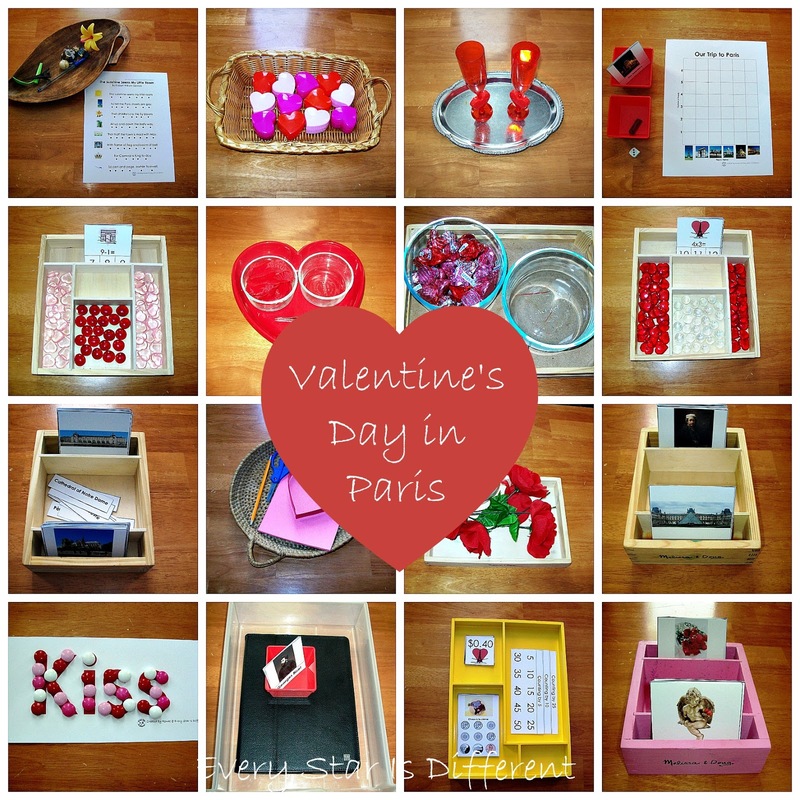 These are wonderful ideas, and I love the French twist on the Valentine's Day theme! Thanks so much for sharing this on my vocabulary building link party!